M4A stands for MPEG 4 Audio and is a filename extension used to represent audio files. M4V is widely used in iTunes and other music stores. If you want to extract audio to M4A from iTunes M4V movies, TV shows, and music videos for enjoying on your Music Players, the tool you need is M4V to M4A Converter. And among all M4V Converters in the market, NoteBurner M4V to M4A Converter gets a roaring reputation. As mentioned above, NoteBurner M4V to M4A Converter is the best tool to convert DRM M4V to M4A. Then why do we choose this tool instead of other M4V Converters? Intuitive interface and support batch conversion. Part 1: How to Convert M4V to M4A on Mac OS X EI Capitan (10.11) ? Step 1. Launch NoteBurner M4V to M4A Converter, click on the Add Movies button, then you will see the pop up windows which will show you all the iTunes purchases and rentals. This iTunes DRM removal software enables you to add your iTunes video from the needed media catalog such as Movie, TV Shows, Podcasts, etc. Step 2. The added video will show up on the main panel after adding. Then you just need to choose the right output format according to your need from the output profile list. 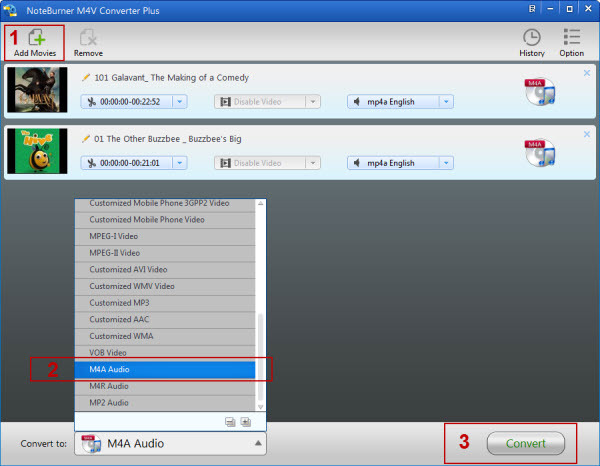 To convert M4V to M4A, output format as "M4A Audio" is recommended. Step 3. When finishing customization, click on the Convert button at the bottom to start the conversion. During the conversion, please make sure you are not clicking on the button to control iTunes. Then you just need to wait till the conversion is completed. Part 2: How to Extract Audio to M4A from iTunes DRM M4V Videos on Windows 10? Step 1. 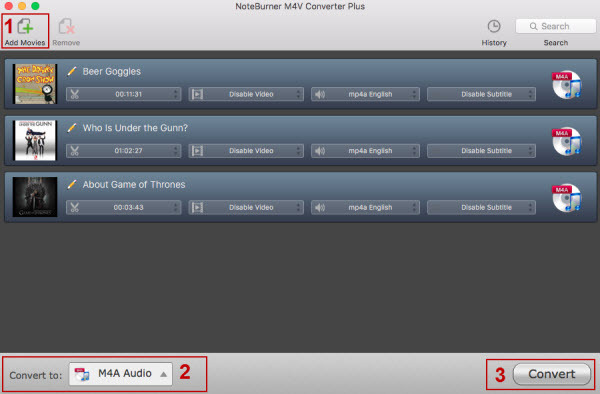 Launch NoteBurner M4V to M4A Converter, and import the iTunes rented and purchased videos either by clicking the "Add Movies" button or directly dragging them to the program interface. Step 2. Click the button after "Convert to" to choose output format. To convert M4V to M4A, you can set the output format as "M4A Audio". Step 3. Click the "Convert" button to start converting M4V to M4A. Once the video is converted, you can check the M4A audio files by clicking the "History" button. Now, you can import the converted M4A audio to your devices for enjoying. Note: NoteBurner will offer you a 1-minute free trial which allows you convert one minute of iTunes M4V videos to other formats for free. If you want to unlock the restriction, now buy the full version with $44.95 ($49.95).